Discover the highlights of Ecuador and the colonial treasures of Quito, the "Florence of South America". Board your very own private cruise, chartered exclusively for your party. 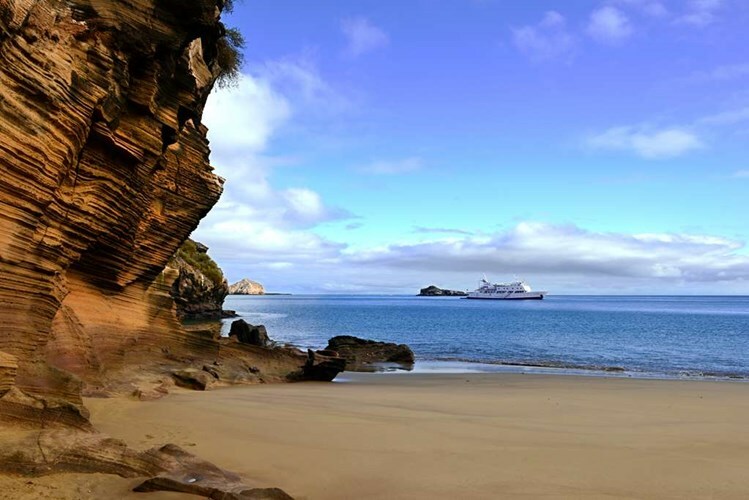 You will cruise through the Galapagos Islands discovering its flora and fauna with your personal expert guides at various islands: Baltra, Santa Cruz, Sombrero Chino, Rabida, Santiago, Fernandina, Isabela, and San Cristobal. Evening international flight arrival to Quito. Upon disembarking your plane, you will be met by your VIP assistant at the gate and escorted through immigration and customs hassle-free, without waiting in line. As you exit the secured area with your luggage, you will then be greeted by your personal host who will take you to your car for your private transfer to your luxury boutique hotel. 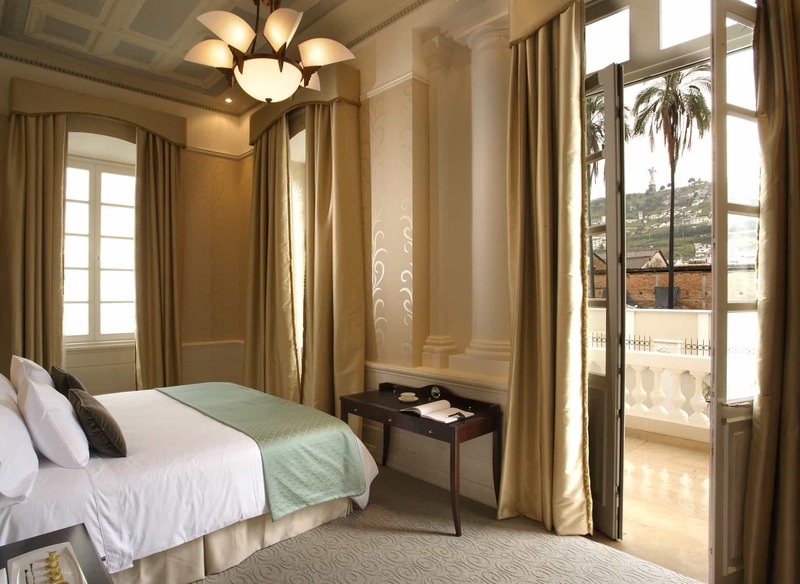 Private guided tour of the colonial treasures of Quito. Spread across a spectacular Andean valley and flanked by 14 volcanic peaks, Quito’s setting alone is enough to strike you speechless. 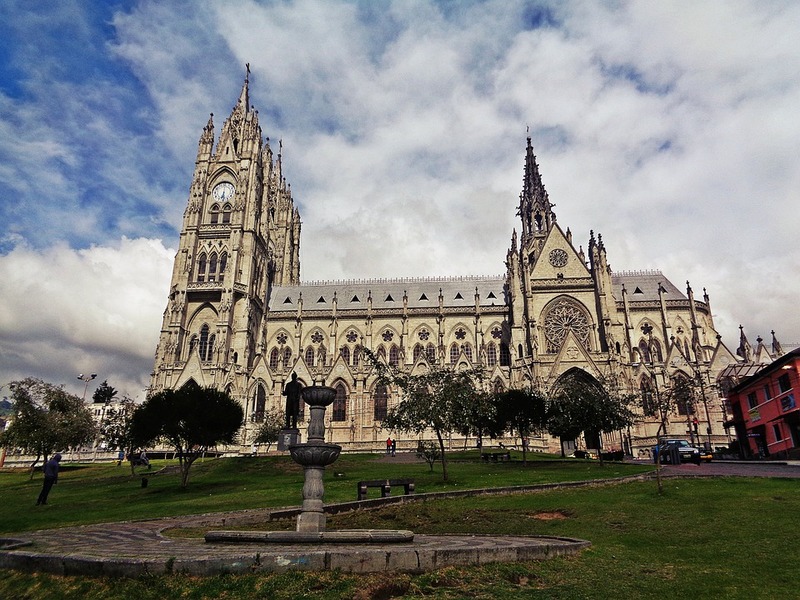 With your personal guide, you will visit its main historical highlights which include Monaterio de San Agustin (Quito’s oldest monastery), the elegant church of San Francisco, the Presidential Palace and the Archbishop’s Palace. In the early evening, enjoy a guided tour of Quito’s architectural highlights, which are beautifully lit at night. Afterwards, you will enjoy exclusive access La Compañía de Jesús church followed by drinks on the roof. Private transfer with your host to Theatrum restaurant, located within the Sucre National Theater and is one of Quito’s finest restaurants. 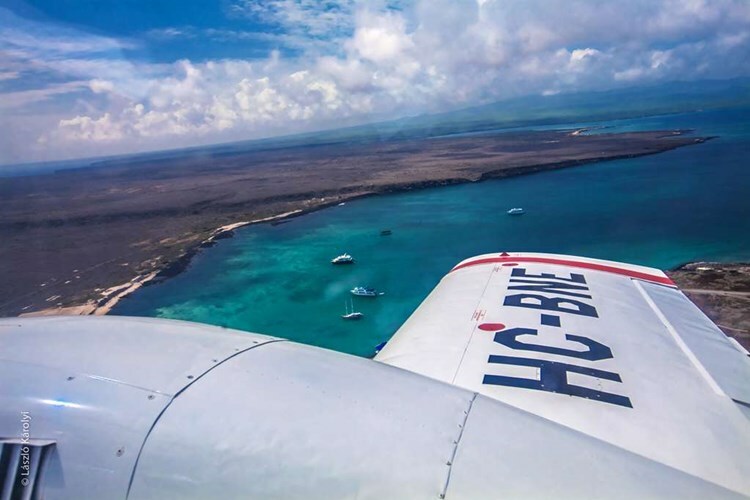 Private transfer to the airport for your flight to the Galapagos Islands (Baltra) via Guayaquil. 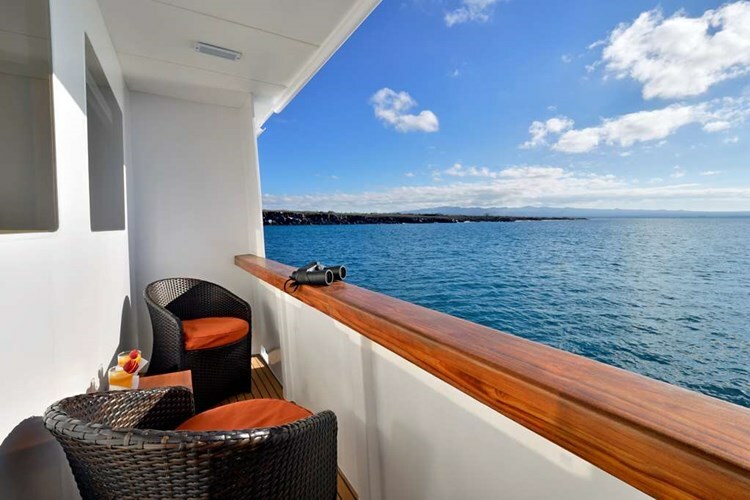 Greeting by your host and transfer to your private cruise ship, the most luxurious mega yacht in the Galapagos Islands. It accommodates up to 16 guests, with four suites on the aft below deck as well as two suites on the front main deck. 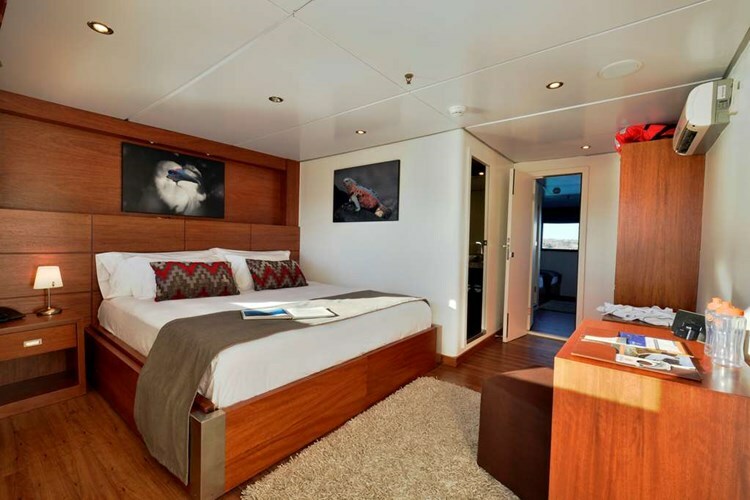 There is also a master suite on the second aft deck which features its own private access to an outdoor lounge. In addition, the 38-meter-long yacht is specially designed and refitted to be as ecologically-friendly as possible so that it does not disrupt the delicate balance of the islands. Embark on your 7-night journey aboard your private chartered cruise. After lunch, visit Santa Cruz Island and explore the Charles Darwin Research Center. Later, board your ship and enjoy a welcome cocktail and dinner onboard. In the morning, visit Sombrero Chino, named after its shape formed by volcanic rock similar to that of a traditional Chinese hat. 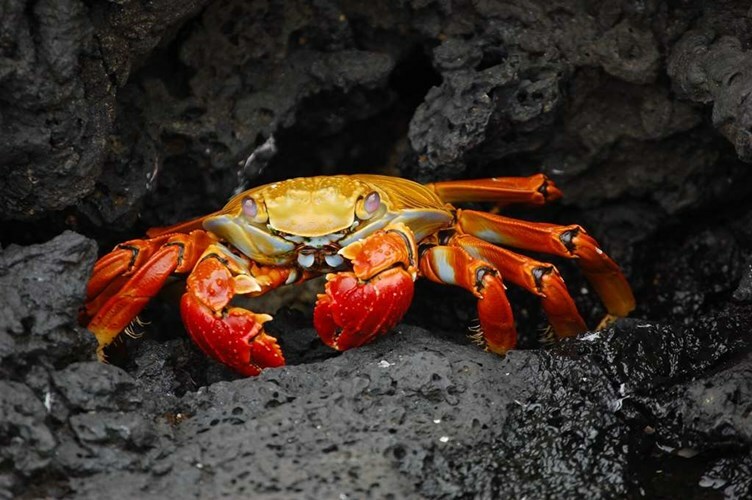 Since it was given a maximum visiting capacity by the National Park Service it offers rare, up close viewing of Galapagos wildlife and well preserved remnants of fragile volcanic rock that can’t be found in such a unique condition anywhere else. The islet is home to a colony of sea lions on the white coral sand beach. Here you can see American Oyster catchers, Galapagos Penguins swimming along the shores, and Sally-Lightfoot Crabs in bright contrast to the dark volcanic rock. Later, return to the ship and enjoy lunch. In the afternoon, visit Rabida Island, known for its red sand beaches. The high amount of iron contained in the lava at Rábida gives it a distinctive red color. White-Cheeked Pintail Ducks live in a salt-water lagoon close to the beach, where brown pelicans and boobies have built their nests. 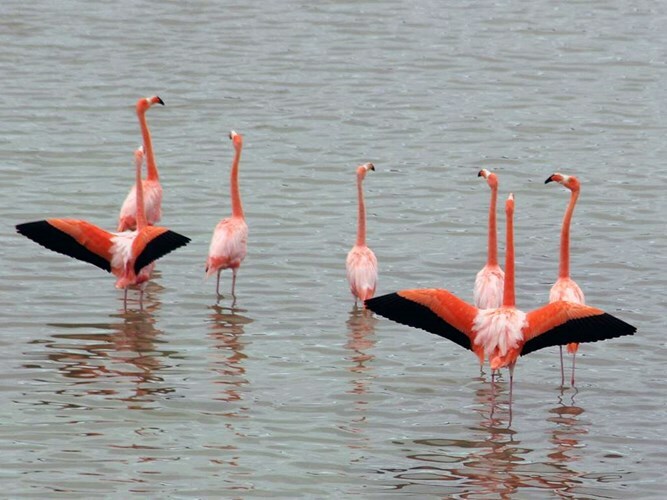 Up until recently, flamingos were also found in the salt-water lagoon, but they have since moved on to other islands, likely due to a lack of food on Rábida. Nine species of Finches have been reported in this island. Return to the ship and enjoy dinner on board. In the morning, go swimming and snorkeling off of Santiago Island. Visit Espumilla Beach where the large coffee-colored sand beach is just north of the prized fresh water supply that once attracted pirates and whalers. A short walk inland will take you through a mangrove forest normally inhabited by the common stilt. Sea turtles also visit these mangroves to nest. Beyond the mangroves is a brackish lagoon where flocks of pink flamingos and white-cheeked pintails can be seen. Sea turtles often lay their eggs on Espumilla Beach. Later, sail to Buccaneer Cove on Santiago. Here you can learn how Santiago Island was once a refuge for British buccaneers. These pirates would anchor in the protected bay to make repairs and stock up on tortoise meat among other things. The steep cliffs, where hundreds of seabirds perch in front of the dark red sand beach, are a magnificent site. Return to the yacht to enjoy lunch. In the afternoon, visit Puerto Egas in Santiago, well-known for its black sand beaches. It once was the site of small salt mining industry in the 1960s. A hike inland to the salt crater is an excellent opportunity to sight land birds such as finches, doves, and hawks. A walk down the rugged shoreline will turn up many marine species. Iguanas bask on the rocks and sea lions laze in the tide pools. At the end of the trail there is a series of grottoes or sea caves where fur seals and night herons are found. Return to the ship and enjoy dinner onboard. In the morning, visit Espinosa Point on Floreana Island. 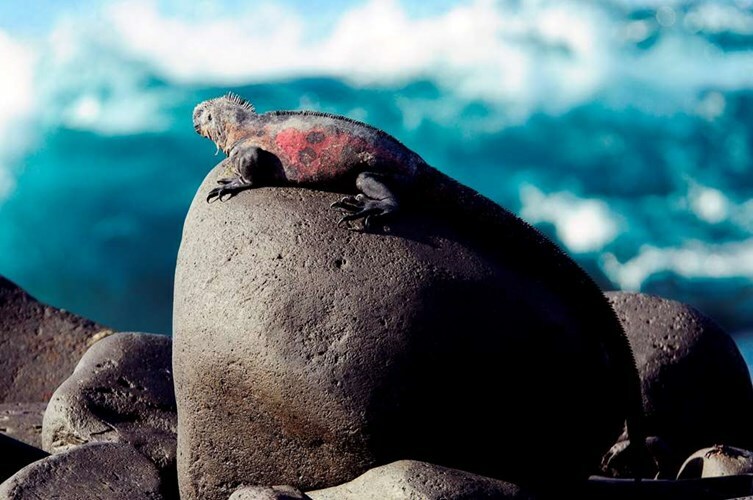 Punta Espinosa is a narrow stretch of land where hundreds of marine iguanas gather largely on black lava rocks. The famous flightless cormorant inhabits this island and Galápagos penguins, pelicans and sea lions are also abundant. Different types of lava flows can be compared and the mangrove forests can be observed. In the afternoon, visit Tagus Cove on Isabela Island. Named after a British warship which anchored here in 1814, this cove is located to the west of the island and you can take a panga (zodiac) trip below the high cliffs. 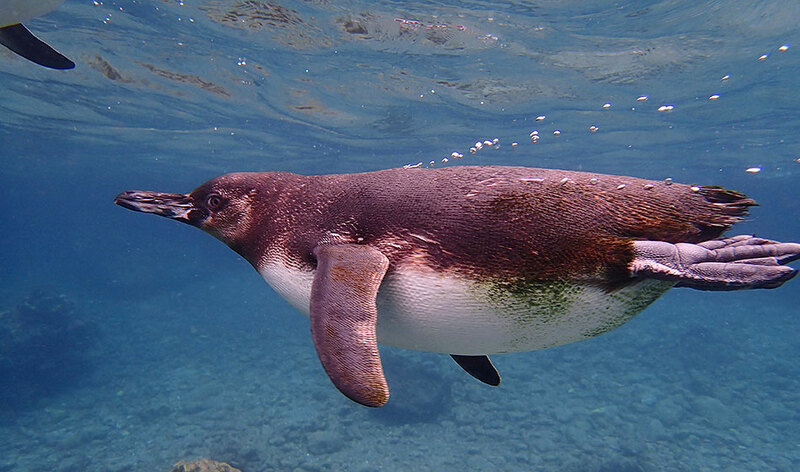 Here there is an opportunity to see penguins as well as marine iguanas, Sally Lightfoot crabs and sea lions. Blue-footed boobies are also in abundance. In the morning, visit Elizabeth Bay on isabela Island. Elizabeth Bay is a marine visitor site. As enter you the bay Galápagos hawks can soar overhear and schools of pompanos and dorados can be seen swimming underneath you. Las Marielas, the small islets just outside the bay, are home to the largest concentration of Galápagos penguins living in the Islands. You can also see a red mangrove cove, passing through the red root and green leaf breeding ground for fish. In the afternoon, visit Moreno Point on Isabela Island. Here you can see beautiful rocky shores where penguins and shore birds, including great blue herons, are usually spotted. You can also enter a grove of mangroves, where oysters can be seen at the base of the trees. A trek traverses the sharpest lava rocks in the Islands where dry lava is interspersed with lagoons and small ponds containing abundant wildlife. In the morning go on a snorkeling excursion a short distance from Puerto Villamil is the small island known as Las Tintoreras. Here a colony of white tip sharks can often be seen resting in a lava canal. You can snorkel or swim in the unique habitat of these animals. On the nearby sandy beaches, sea lions play and relax in the sun. This is one of Isabela's most beautiful visitor sites. Later, head to the wetlands of Isabela. The Wetlands consist of lagoons, swamps and mangroves and are home to a variety of unique bird species such as common stilts, whimbrels, white-cheeked pintails and gallinules. The Wetlands can be visited on foot via a path that winds through the swamps. In the afternoon, head to the Wall of Tears on Isabela where you can learn about the human history of the island. Between 1946 and 1959 Isabela was a penal colony, where prisoners were made build a wall with huge blocks of lava as punishment. Due to the arduous labour and harsh conditions in which the prisoners lived, this site is known as the wall of tears. A set of stairs provides a bird's eye view of the wall and the surrounding landscape. You can still see the foundations of a USA base from the Second World War. Later, visit the Tortoise Breeding Center. This center was created to protect animals in their first years of life from the threats of foreign species such as pigs and donkeys. Giant tortoise eggs are collected and brought to the center where they are hatched and kept for five years before being released to their natural environment. Return to the ship and enjoy dinner onboard. In the morning, head to El Chato Volcano on Santa Cruz Island for some light hiking. 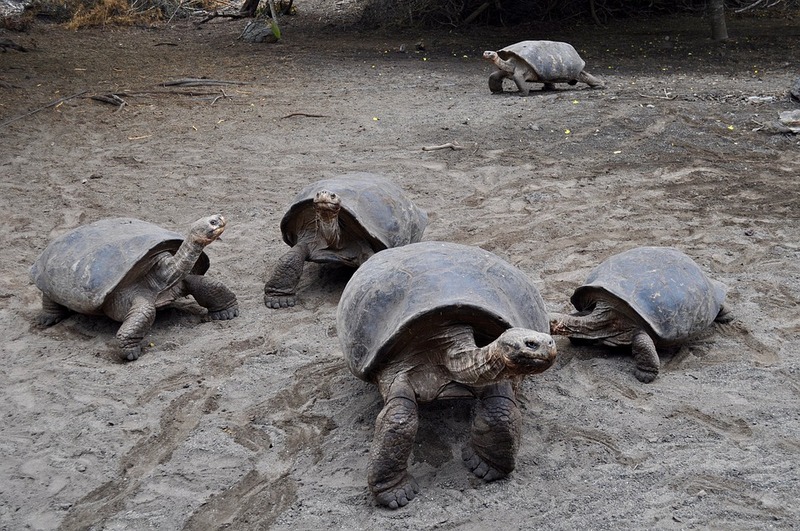 El Chato is a reserve in the highlands of Santa Cruz, where you have the amazing opportunity to observe the magnificent giant tortoise in the wild. This area is vegetated with transition zone vegetation and is located in the humid zone of the highlands of Santa Cruz. The walk to the reserve is one of the best places to observe ground birds, tree and ground finches, the vermilion flycatcher, cattle egrets and occasionally Galápagos rails. Continue to the highlands located in the northern part of the island and can reach elevations up to 1500 meters. On a journey into the higher elevations of Santa Cruz you will experience all seven different vegetation zones. The vegetation here is abundant and lush and the weather moist. In the afternoon, visit Tortuga Bay on Santa Cruz. This is a pristine location with a beautiful white-sand beach where you can swim, snorkel, and kayak. Tortuga Bay is also a favorite place for sea turtles (which gave the beach its name), sea lions, marine iguanas, pelicans, flamingos and lava gulls which are endemic to the Islands and are commonly found along the shore of most beaches. Visitors enjoy expositions on natural history, human history, and conservation. The conservation efforts represent the movement to protect the wildlife and natural environment through means of population and tourist control. The Interpretation Center has an outdoor stadium, audio-visual equipment, and meeting rooms. Afterwards, head to the San Cristobal airport where you will board your flight to Guayaquil in the mainland. Upon arrival in Guayaquil, you will be greeted by your host who will assist you with check-in for your international flight home. 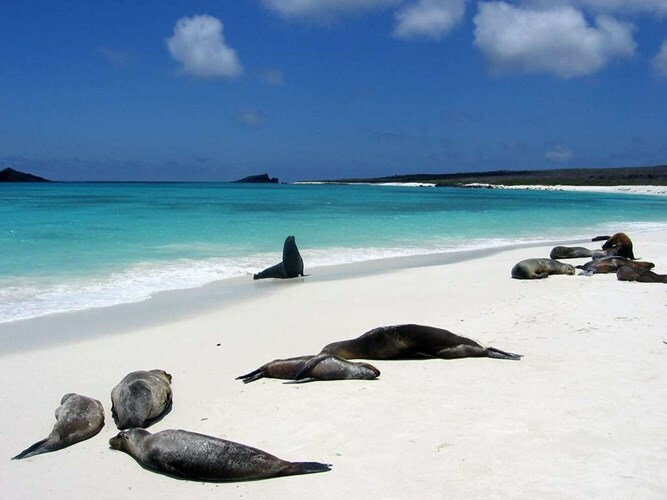 If you're interested in a luxury private yacht tour in the Galapagos Islands, contact us at 604-736-7447 today! Our Adventure Travel Specialists will design your perfect adventure to South America.